Epson EcoTank ET-2600 printer is a 3-in-1 printer which can print, scan, and copy the document. The printer covers 445‎ x 304 x 169 mm of space and has a weight of 4.6 Kg. By incorporating Epson’s Micro Piezo printhead and Epson EcoTank ET-2600 ink, the printer provides clean, clear text and graphics. The printer comes with a good printing resolution of 5,760 x 1,440 dpi. Moreover, CIS scanner type the printer offers scanning resolution of 1,200 x 2,400 dpi which is good enough. The input tray capacity of the printer is 100 standard sheets or 20 photo sheets. For trouble-free printing, the printer comes with the wired and wireless connection, depending on the specific need. With Epson Connect i.e. iPrint or Email Print one can easily print from anywhere. To improve efficiency, the printer can yield 4,000 monochrome pages and 6,500 colour pages. When performance is the concern, the printer somehow lacks behind the other printers, yet it provides an average printing speed of 10 ppm and 5 ppm for monochrome and colour respectively. Multi-functional EcoTank ET-2600 printer has upgraded its ink system with the refill Epson EcoTank ET-2600 ink tank. The printer provides professional quality prints with an advanced printhead. Wireless connectivity options and flexibility with multiple operating systems are add-ons of this versatile printer. It is perfect for home office and home projects. How can I fix incorrect colours issue for my Epson EcoTank ET-2600 printer? The paper type setting should match the paper you loaded in your printer. Ensure that Black/Grayscale or Grayscale setting is not selected in your printer software. Check if any of the printhead nozzles are clogged or not. Run a nozzle check and clean the printhead, if needed. Also, low Epson EcoTank ET-2600 ink levels may be a reason for incorrect colors. Visually check the ink levels and refill them. Avoid using expired or dry ink for your printer tank. Use genuine Epson EcoTank ET-2600 ink and paper for best results. If your Epson EcoTank ET-2600 printer is unused since a long time, run the Power Ink Utility. Doing this will replace all the ink inside the tubes, so flush the ink only if you cannot improve the print quality by other methods. How to resolve the blank pages print issue for Epson EcoTank ET-2600 printer? Ensure that you select the correct paper size settings in the printer software and the printing software. While printing, if a blank page exists in a document and you want to skip printing it, select the Skip Blank Page option in your printing software. Clean the print head nozzles if necessary. Ensure that your product is selected as the printer in your printing program. Make sure that your Epson EcoTank ET-2600 ink tank is not empty. Check the ink levels and refill them in case the ink is low. Q. 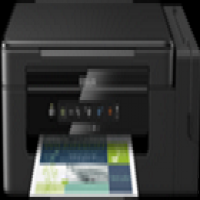 Is the Epson EcoTank ET-2600 printer capable of wireless printing? A. Yes, Epson EcoTank ET-2600 printers do come with Wi-Fi support, which allows you to wirelessly connect to various mobile devices and computers simultaneously. This feature is great for household application and for small offices, as all devices can be connected to one printer itself. Q. Will I have to compromise on quality when using your compatible Epson EcoTank ET-2600 ink? A. Absolutely not! We use premium quality ink for all our products. Even though our compatible inks are cheaper than the originals, we do not compromise on the quality. We assure you that you will be extremely satisfied with the quality of our compatibles. Q. What is the input tray capacity of Epson EcoTank ET-2600 printers? A. The input tray of Epson EcoTank ET-2600 printers can handle up to 100 sheets of paper and up to 20 sheets of photo paper at one time. Q. How do I refill the ink tanks when the Epson EcoTank ET-2600 ink is running low? Open the cover of the ink tank unit, and remove the ink tank cap. Remove the cap cover of the bottle. Open the cap of the ink bottle, remove the seal and re-install the cap on the ink bottle. Be careful not to spill any ink. Refill the ink tank with the corresponding ink bottle. Close the ink tank cap and shut the cover on the tank unit. Q. Do your compatible Epson EcoTank ET-2600 inks come with a warranty? A. Yes, we provide a warranty for 12 months on all our products. If you face a problem with any of our products while they are still in the warranty period, please contact our customer care so as to find a solution to your problem. If the issue is unfixable, we will arrange for a replacement or refund for the same.